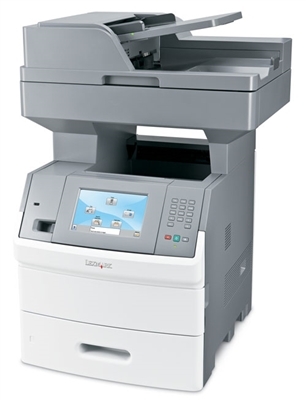 The Lexmark X654de Multifunction Laser Printer packs more benefits than ever into a high-performance, space-saving multifunction laser. There are enough things that can slow you down in a day, but your documents shouldn't be one of them. Power up your workgroup with reliable, ultra-fast printing and copying. Plus, you can boost productivity with superior color-scanning capabilities and efficient workflow solutions. If you're looking for smart ways to lower costs while reducing the environmental impact of printing, go with the Lexmark 16M1265. It boasts powerful print speeds and intelligent time-saving features that are designed to make your workday more productive. Lexmark offers you more options, more versatility and more functionality for a truly customized solution. What's more, the Lexmark X654de Multifunction Laser Printer is equipped with state-of-the-art security to protect your valuable corporate data. Toner and drum are not included with the purchase of the machine.